Although the fat content in almond milk is about three grams per serving, the fat has been found to be heart-healthy. It may also help individuals who are overweight in managing their weight. Almond milk is a drink made from ground almonds, having a slightly beige color, creamy texture, and nutty taste. 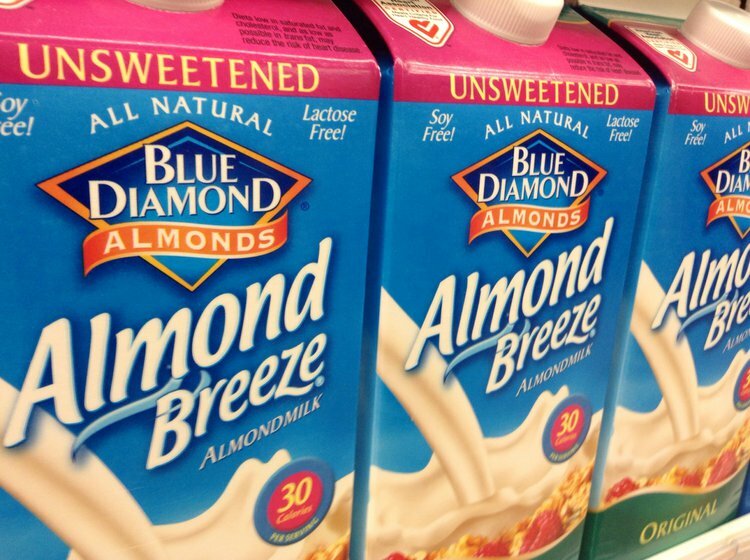 The consumption of almond milk has been growing rapidly over the past years as a substitute for cow’s milk. Since it contains no animal products, the consumption of almond milk has been increasing, especially among vegans and vegetarians. It is important to take note that almond milk does not contain the same amount of protein as cow’s milk, but there are many other benefits of almond milk that cow’s milk cannot provide. Almond milk may help individuals who are overweight in managing their weight. In terms of almond milk nutrition, it is very low in calories, containing only 40-60 calories per serving. Whole cow’s milk, on the other hand, can contain up to 146 calories per serving. This can give individuals a tasty drink to consume without the guilt of additional calories. Although the fat content in almond milk is about three grams per serving, the fat has been found to be heart healthy. Moreover, almond milk is very low in sodium, has no cholesterol, and has 150 milligrams of potassium per serving. Potassium in the milk helps keep blood pressure levels normal and aids in maintaining a healthy heart. The high potassium to sodium ratio is beneficial in lowering the systolic blood pressure. Studies have suggested that individuals who consumed 4069 milligrams of potassium per day had a 49% lower risk of death from ischemic heart disease, compared with those who consumed less potassium, which is approximately 1000 mg per day. The vitamin D found in almond milk also helps the body fight high blood pressure and enhance the absorption of minerals such as calcium, iron, magnesium, phosphate, and zinc. This can help keep the bones healthy and strong. Researchers at Boston University have suggested that vitamin D normalizes blood pressure, possibly by decreasing the production of a hormone called rennin, which is responsible in some way for high blood pressure. Almond milk could possibly help fight the vitamin D deficiency pandemic that is a worldwide phenomenon. The potassium content in almond milk may also improve brain function. Potassium has been linked to increase blood flow to the brain, enhancing thinking ability, concentration, and brain activity. Vitamin D is known to improve cell function and immunity, and also has the potential to help decrease the risk of Alzheimer’s disease. Almond milk contains 50% of the daily recommendation of vitamin E, which contains antioxidant properties essential for skin health such as protecting against sun damage. Jalali-Khanabadi, B. A., Mozaffari-Khosravi, H., & Parsaeyan, N. (2010). Effects of almond dietary supplementation on coronary heart disease lipid risk factors and serum lipid oxidation parameters in men with mild hyperlipidemia. The Journal of Alternative and Complementary Medicine, 16(12), 1279-1283. Jenkins, D. J., Kendall, C. W., Marchie, A., Parker, T. L., Connelly, P. W., Qian, W., ... & Spiller, G. A. (2002). Dose response of almonds on coronary heart disease risk factors: blood lipids, oxidized low-density lipoproteins, lipoprotein (a), homocysteine, and pulmonary nitric oxide a randomized, controlled, crossover trial. Circulation, 106(11), 1327-1332. National Institutes of Health, Office of Dietary Supplements. Dietary Supplement Fact Sheet: Calcium. Accessed February 12, 2013. Sacks, F. M., Svetkey, L. P., Vollmer, W. M., Appel, L. J., Bray, G. A., Harsha, D., ... & Cutler, J. A. (2001). Effects on blood pressure of reduced dietary sodium and the Dietary Approaches to Stop Hypertension (DASH) diet. New England journal of medicine, 344(1), 3-10. Sarubin Fragaakis A, Thomson C. The Health Professional's Guide to Popular Dietary Supplements. 3rd ed. Chicago, Il:American Dietetic Association;2007. Pereira, P. C. (2014). Milk nutritional composition and its role in human health. Nutrition, 30(6), 619-627. Ren, W. M., Liu, X. F., Zhang, L. Y., WANG, B. J., & ZHANG, H. P. (2006). Development of health promotional beverage made by combination of almond and milk. China Dairy Industry, 34(11), 29. Villegas, B., Carbonell, I., & Costell, E. (2009). Acceptability of milk and soymilk vanilla beverages: demographics consumption frequency and sensory aspects. Food Science and Technology International, 15(2), 203-210. Venter, C. (2009). Cow's milk protein allergy and other food hypersensitivities in infants. J Fam Health Care, 19(4), 128-34.